This was a day Darin and I were down in the doldrums. At this point; it was hard to keep our heads in the game and keep looking ahead. 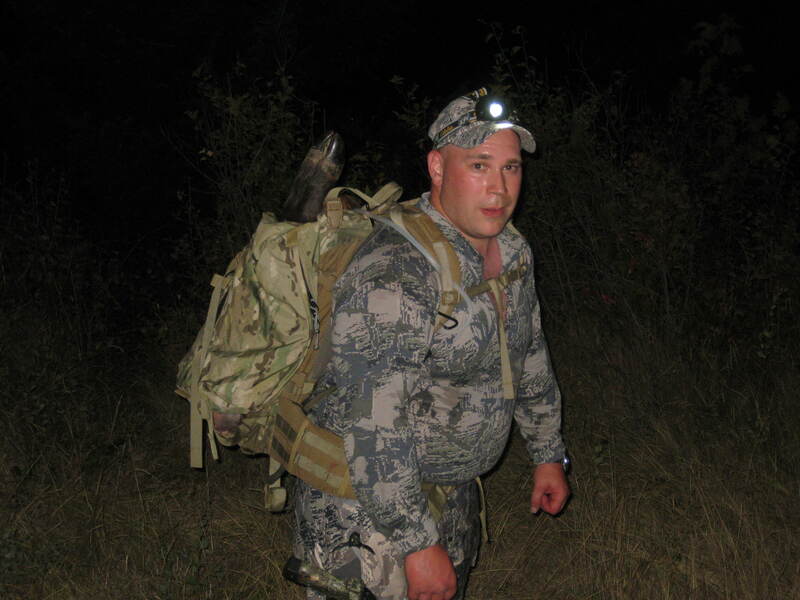 “Aug 31st-day 5 of hunting. I have been back from my Alaskan adventure exactly one week and still have not quite settled back into my normal, everyday groove. In fact it was several days before my body realized that it wasn’t in the Arctic anymore. As we headed farther South and the temperature rose; my “thermostat” seemed to rebel on me. It was set to deal with temps between twenty and fifty degrees, with icy wind chills. And my internal clock was used to days that started with a five a.m. sunrise and ended with a sunset close to midnight. 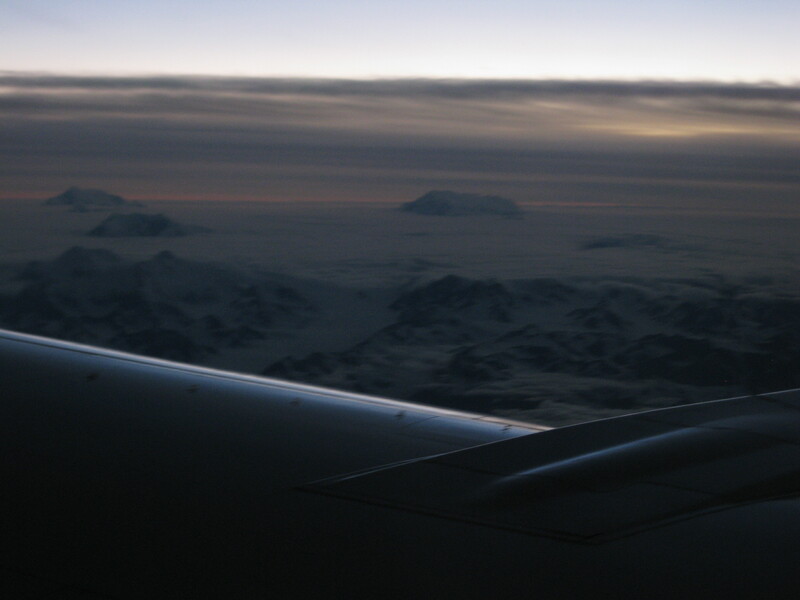 Ah…the “land of the midnight sun”! Since it will take some time to wrap my mind around my recent experience, enough to re-tell it; I figure a rough overview is in order. So much happened on this trip…I really don’t even know where to begin! There were a few days that seemed an entire adventure unto themselves and seemed to last far past any twenty four hour period. 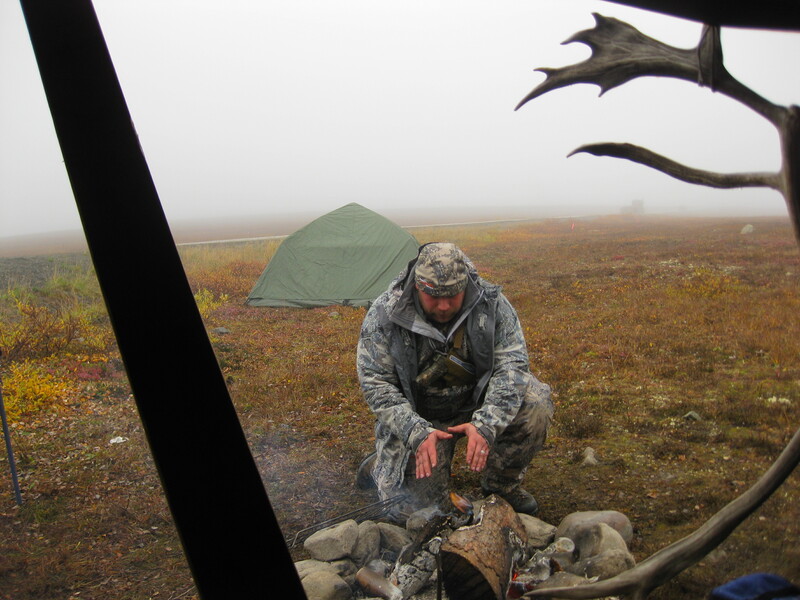 Some of the highlights included two different stalk attempts on Grizzly Bears, being “lost” out on the tundra for seven hours; during thick fog and freezing rain, which didn’t allow Darin and I to get back to camp until around eleven o’clock at night. 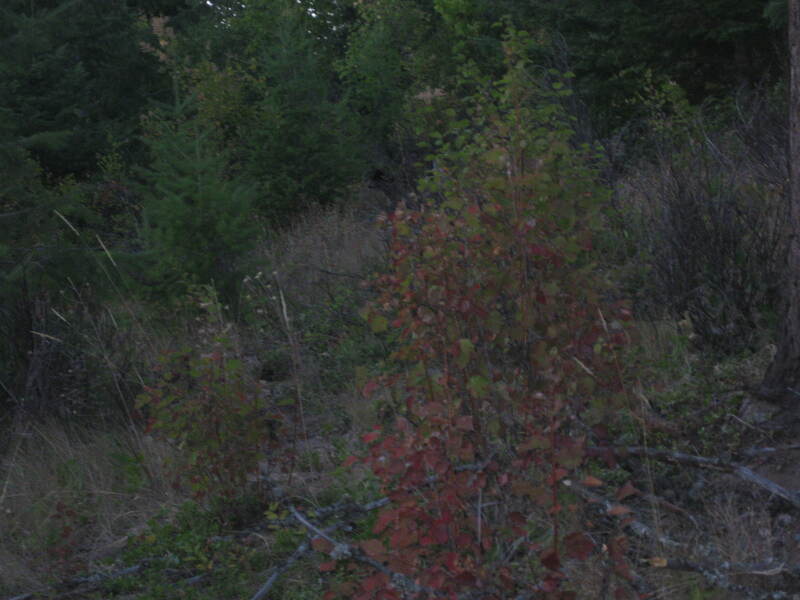 A couple very memorable stalk attempts on two magnum caliber bulls; one of which was completely caught on film. Awaiting in ambush along the Sag river for a herd of Caribou to commit to crossing. Having someone siphon gas from Brandon’s truck and attempt to siphon from ours. We saw quite a few animals that I was very excited to see; including Musk Ox, Red Foxes, a silver Hoary Marmot, Wolves, Ptarmigan, Dall sheep and obviously Caribou (one of my favorite animals) and Grizzly bears. All in all; this was one crazy adventure and definitely a “true Alaskan experience”! Brandon waiting in ambush; hoping this 7 footer would veer closer in our direction. She is at 89 yards in this pic. Setting up on a ridge; enjoying the sunset...life is good in Montana! As I sit here in my living room, looking out at the beautiful Selkirk Mountains draped in snow; I can’t believe how time flies. It seems like yesterday that I was chasing elk in ninety degree heat and now all is encased in snow and tormented by icy winds. I don’t think I’ve stopped moving since the start of hunting season, back in September and now I’ve just returned home from SHOT Show in mid January. 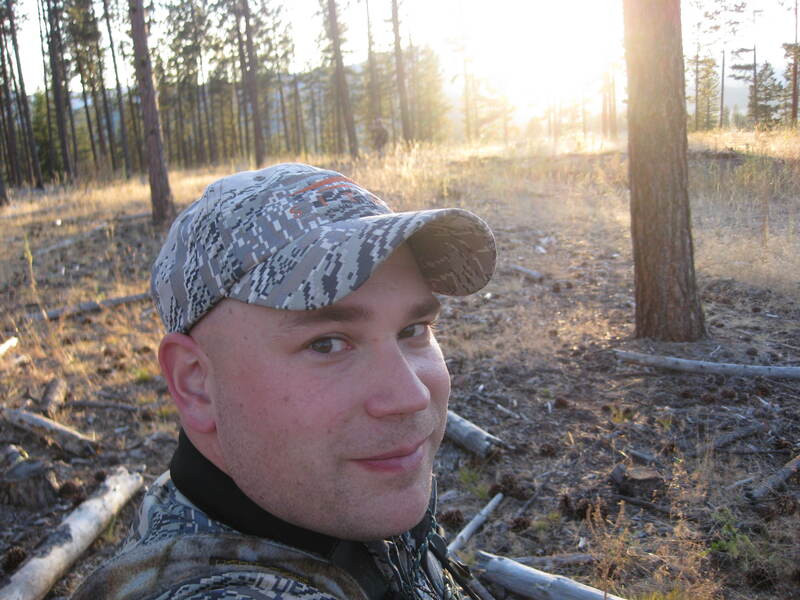 Too much time has passed; now it’s time to sit down and recall my time afield, chasing elk for the first time in beautiful Montana. 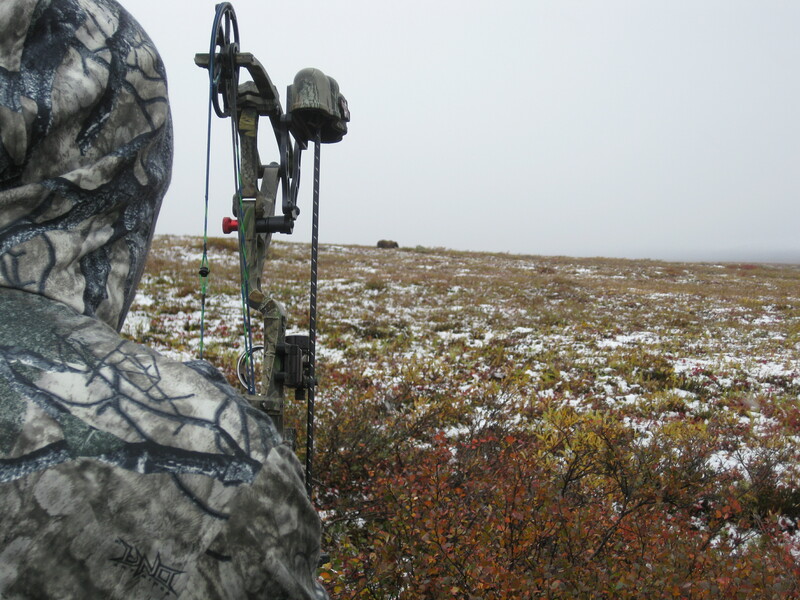 I hope it hasn’t been too long…to recall our “Montana Momentum” which propelled us on into a stellar hunting season. Packing out the last load of Darin's elk on a hot; september night. To recap a little; September started off with a bang…or a “twang”, if you will. Darin was able to arrow a young cow that came into my calls on the afternoon of opening day. 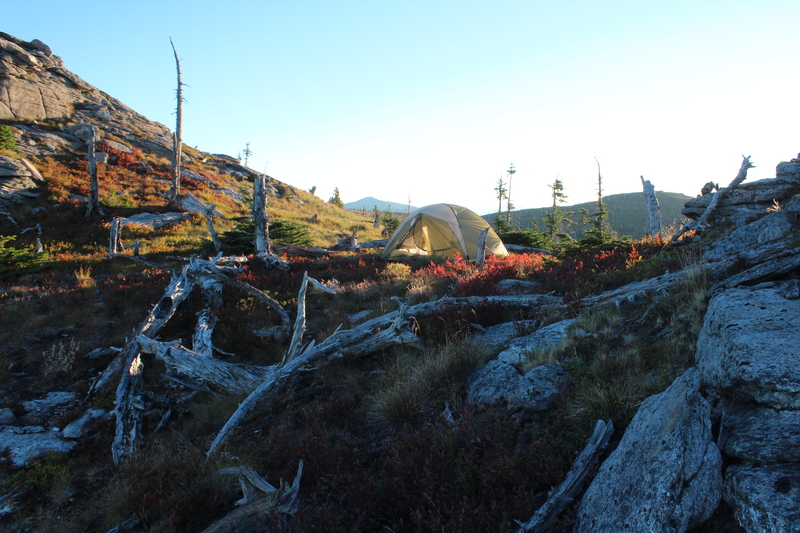 From that point on; I spent my Washington elk season sleeping in a tent by night and in my office chair at work during the day. 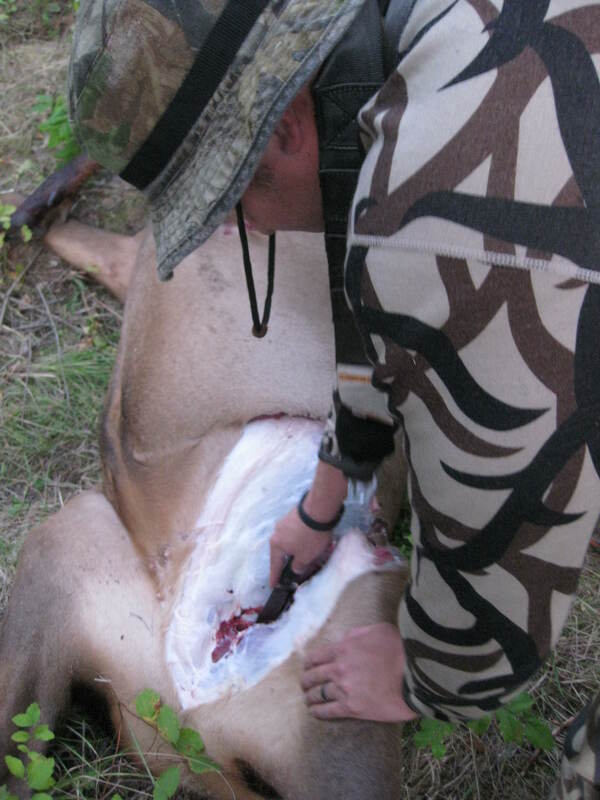 It seemed like I was always having to end the hunt just shy of victory and never had a decent opportunity to send a razor-tipped shaft at an elk. This was okay with me though; because I knew that Darin had an excellent chance in Montana and I wanted to give my full support. Giving my full support meant using my normal 9-10 days of vacation to help him fill his tag; instead of grinding it out, trying to fill my own. Montana has always held a certain mystique for me. It seems so wild and untamed; filled with ancient Indian lore, lost gold mines and epic adventure. Even though I absolutely love where I live; it wouldn’t be hard for me to pack up and move to Montana, given the chance. So of course it wasn’t hard for me to give up my elk season in aide of a friend; I knew that it would be well worth it and looked forward to hearing the bugles of a Montana bull. 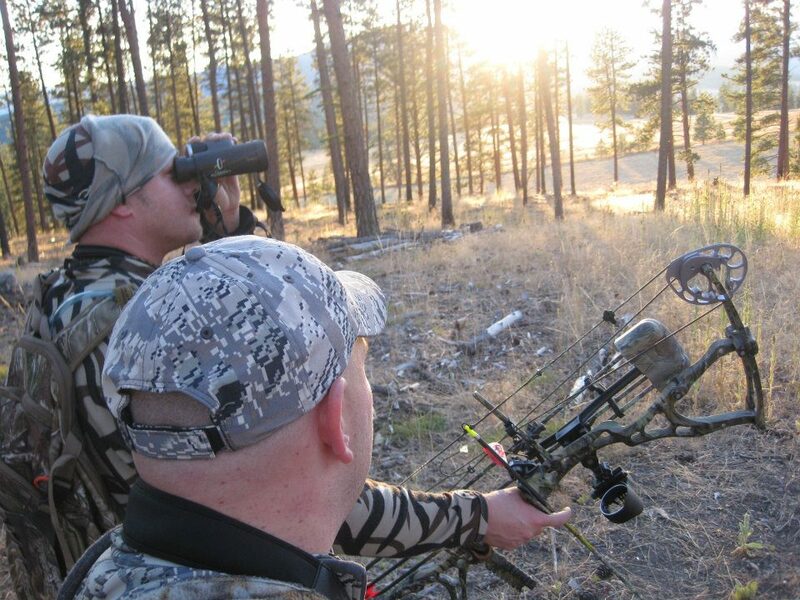 Darin and I glassing a meadow the evening of day one. We were expecting to spend our nights in a tent and fending for ourselves; but Darin’s in-laws had other plans for us. Debbie and Grant possess a rare kind of generosity and always insist that you take advantage of their hospitality; hence we slept in a cozy motorhome instead of out in a tent. Normally I would resist an idea of this sort, on principle alone…it takes away from the experience. But common sense has a way of winning over one’s sense of “adventure” at times…and besides it would be just plain rude to turn hospitality down…right?! 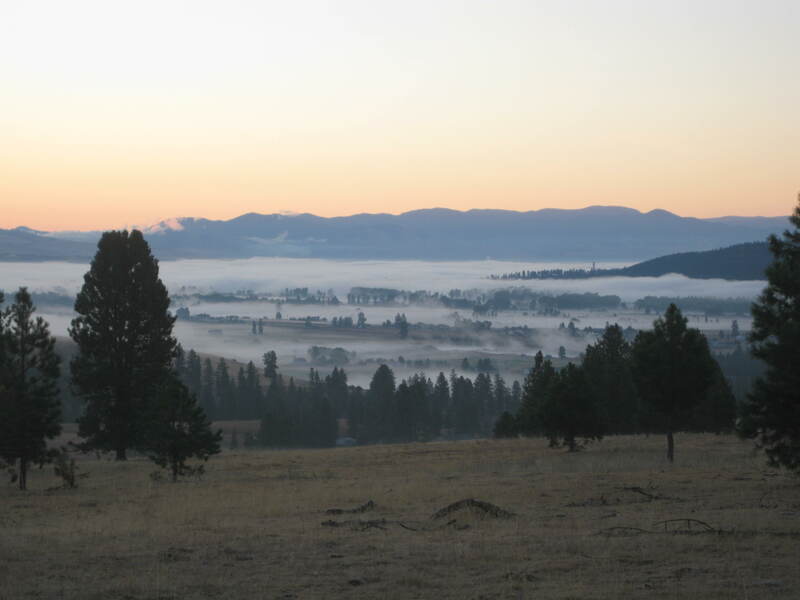 The view down into "The Valley" on our first morning in Montana cattle country. So, we spent our nights in a very spacious motorhome; parked out on a rustic ranch property that was about a 10 minute drive from our hunting area. Early in the year we had been granted permission to hunt some “cattle-lease” land, which did not host any cattle at the time. The ranch hands assured us that this spot (about three miles square) was filthy with elk on a regular basis. Judging by our previous scouting trip; it would appear that they were not exaggerating! During our previous trip to the property; it didn’t occur to me how “suburban” the area really was. It was sandwiched in between upscale housing developments on two sides, open ranch land on one side, leaving the remaining side that was bordered by the freeway…! 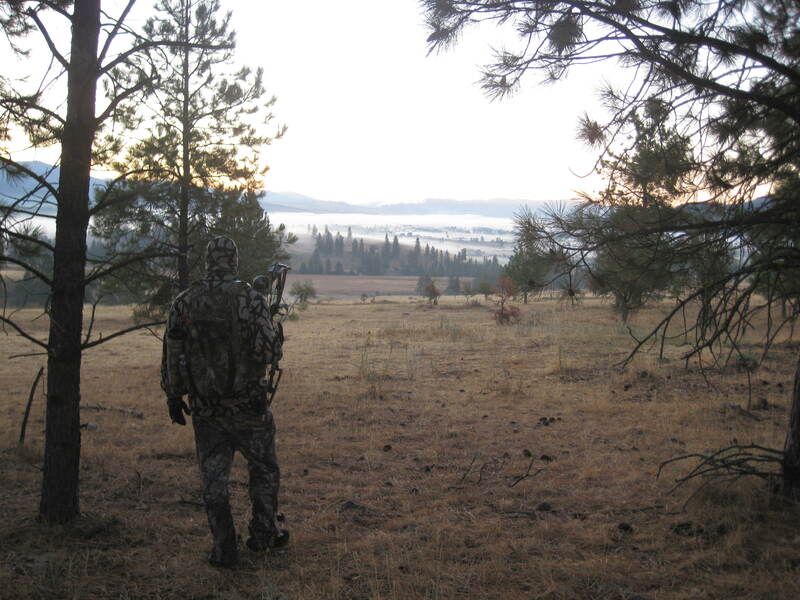 There’s nothing like the sound of a humming freeway at first light; blotting out any chance of hearing a bugling elk! It didn’t take us very long to acclimate though and it wasn’t long before we heard our first bugle. The first morning didn’t produce much; but we did hear a few bugles and saw plenty of fresh sign. We basically circumvented the entire property between the morning and afternoon hunts; which helped to paint a picture of how the animals were moving and got us familiar with the lay of the land. I must add that this type of country was quite a bit different from what we were used to back home. It seemed like every tree was perfectly spaced apart from its’ neighbor; deceptively giving off the appearance of some very open country. Things appeared quite a bit flatter, in comparison to our stomping grounds. But this was a deception as well; because the land was everything but flat. Darin peering into an open meadow; just after we heard our first bugles of the trip. With things being so much more open that what we were used to; this lead to quite a few times when we were able to spot and just “walk right on up” to game. It was a good learning experience; spotting the tell-tale silhouette of a deer, or elk’s neck and head, sticking out of the grass time after time. 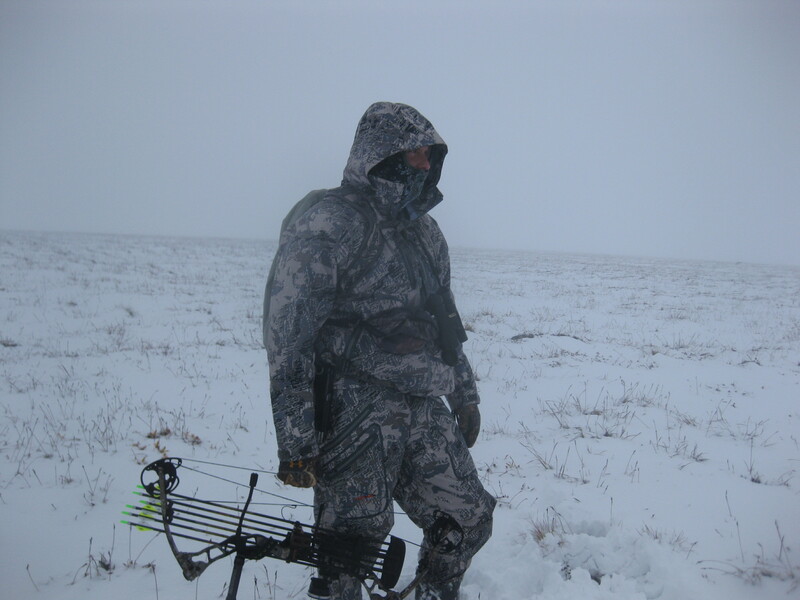 Not only did it help us get familiar with what to look for; but also proved that if we just moved along nice and easy; our camo would allow us to stalk within bow range fairly easy. This lesson stuck with me once we got back into our home woods. It proved that there were just as many animals hiding out in the thick and brushy terrain; you just had to slow down and look for them. I snuck right up on this bedded doe...without even realizing I had done so! This happened repeatedly on this trip and was a never-ending source for amazement and amusement for me. 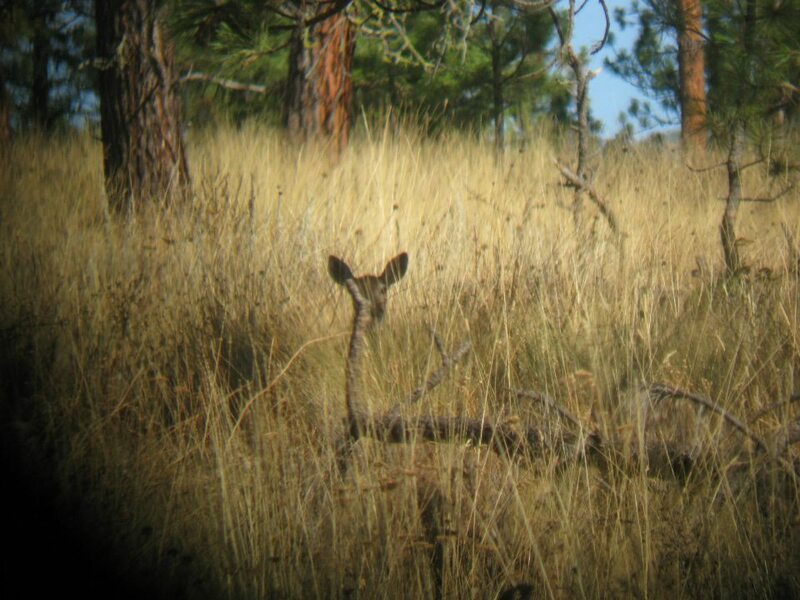 A bino view of the bedded doe. The second morning is when the excitement really started. Leaving the truck with the sound of the freeway buzzing in our ears; we had no idea what was to unfold. We waited until we got several hundred yards from the truck, before we started to throw out some soft cow calls and actually look around. It was exciting to see quite a bit of fresh elk tracks over top of yesterday’s tracks; which seemed to help us tune in to our surroundings. The roar of the freeway seemed to drift away as we heard the high pitch whistle of a bull elk as he bugled into the morning’s first light. Darin setting up while I did a calling sequence...just trying to coax a bull into betraying his position. This definitely woke up our predatory instincts and spurred us into action. 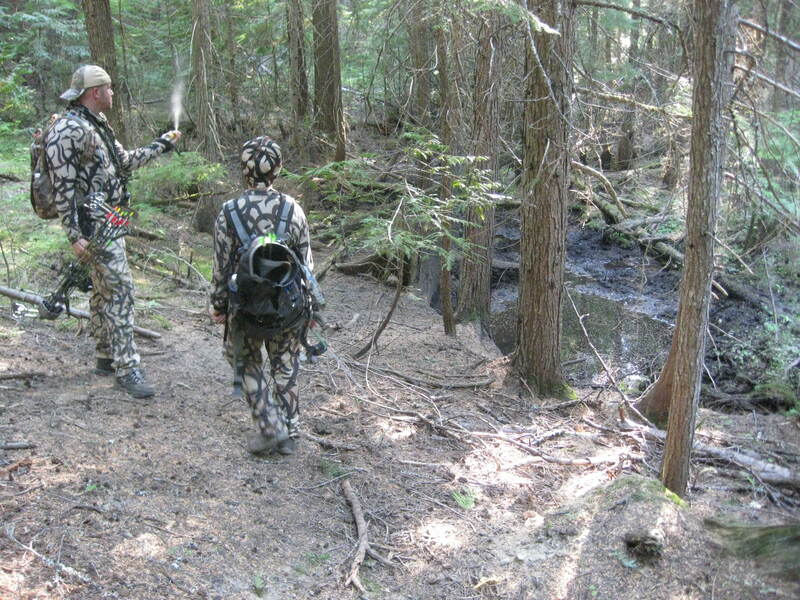 We paused briefly to survey the surrounding woods and come up with a quick game plan. The bugle seemed to be coming from the ridge above us; where the evening before, we had taken the time to distribute some cow in heat scent. About the time we thought we knew what we were about to do; another bugle sounded off, lower down and in front of us. Did we hear the first bugle wrong? Was the bull really below us and not above us like we’d thought? Either way; we knew that we should just keep along a straight line; this would split the difference and give us a chance. The wind was in our favor as we scooted down the logging road; pausing every few minutes to give a few cow calls and listen. Now; it sounded like there were in fact two bulls bugling…one above us and one below. Darin moved up about seventy yards in front of me as I began a calling sequence. I gave a few chirps on my “All Star” diaphragm call, followed up by some hot estrous sounds; on my “Temptress” reed call. About that time; something made me look back, along my backtrail. 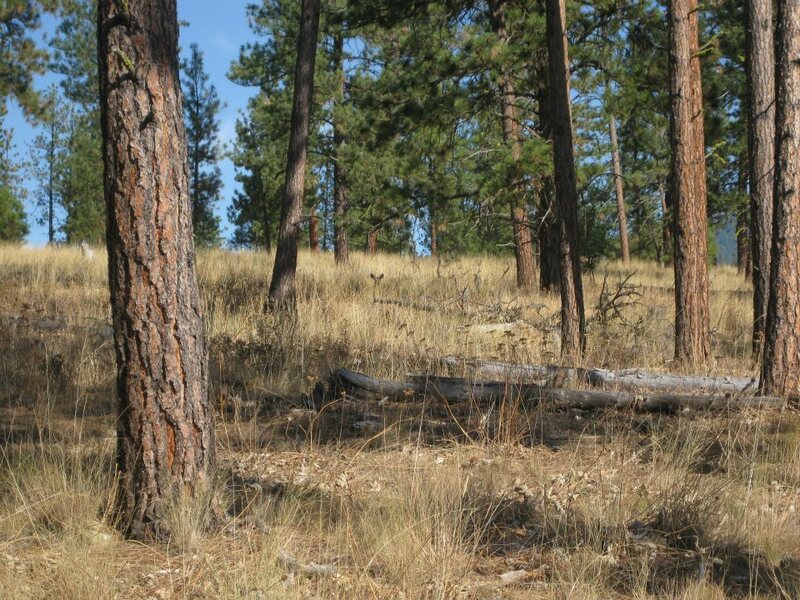 I could see something moving down the ridge behind me…ELK! 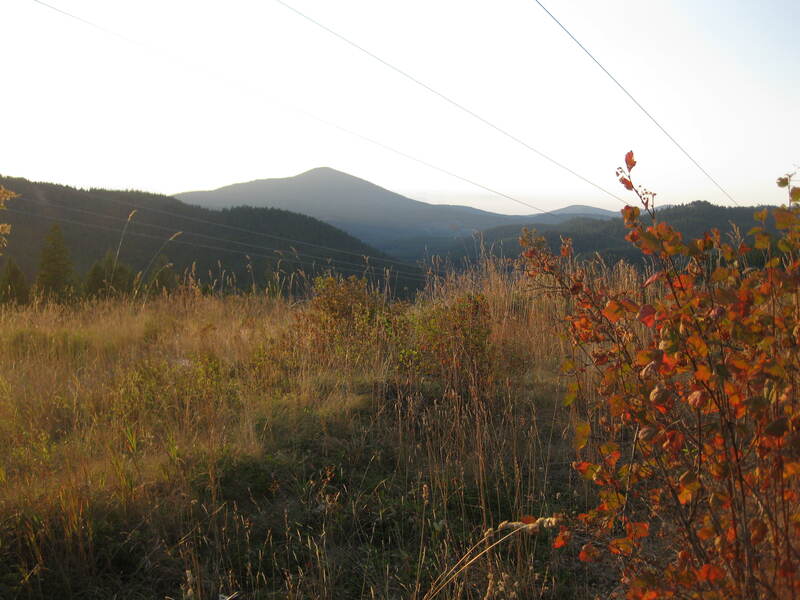 I could see several elk streaming down the ridge on a line parallel to our location. I shot a glance at Darin; who was hopping over a barb wire fence. What to do, what to do? About that time; I heard something very close behind me. I looked over my shoulder and couldn’t believe my eyes: there were a group of ten or so cow elk; crossing the road thirty yards behind me. The very road we had just passed on…and with the wind blowing our scent the very direction they were coming from! This was unreal! It just goes to show the importance of using copious amounts of scent killing products. Oh man, what do I do? All I could think of was that Darin had no clue that “the elk are over HERE!” Once the cows cleared the road and dropped down into a little cut beside me; I tried to get Darin’s attention. About this time; I heard a loud and powerful sounding bugle sounding out somewhere above and to the right of us. I looked around for something to toss at Darin and ended up hucking a rock in his direction. He spun around and looked towards me; I expected him to see what I could see, but apparently his view was obscured. “ELK!” I hissed. “Over HERE”, as I enthusiastically gestured in the direction of where the herd had disappeared. At the time; I didn’t know what had held his attention so well, was in fact another bull; bugling his challenge from a position somewhere in front of us. Darin quickly hopped the fence and moved off in the direction I had last seen the elk. At that moment we experienced a thrill that neither of us will ever forget. A megaphone volumed bugle, that was both hoarse and deep, sounded off from very close to us. At the same time all we could see was ELK…ELK…ELK, streaming into the field in front of us. It looked as if they were being squirted from a garden hose; it was like something out of Yellowstone! I excitedly started throwing mews and chirps in the herd’s direction; which had little to no effect on them. They paused briefly and almost seemed confused; when another thunderous bugle erupted behind them. This time we could see it’s owner; a HUGE bull, with hind-end scratching main beams that bristled with points. I immediately tried to get my anemic point and shoot camera into action; but couldn’t zoom in enough. Once again; excited cow calls erupted from me…almost unknowingly. This turned the bull to face us….oh MAN! Look at how wide his antlers are! He was about a hundred yards out; but man did he look HUGE! All I could think about was trying to get the bull a little closer; but about that time another bugle sounded out a challenge. I really couldn’t tell from where it came from; but it really didn’t matter to this herd bull. He promptly screamed out an answer and started his harem into motion. The only thing I could think of was to bugle a challenge of my own at him; hoping that since we were basically inside his “wheelhouse”; that he’d feel threatened enough to come closer. My calls and bugles didn’t have any effect on the bull, or his herd. Once they started to move out they just kept on going. We paused for a second; excitement overcoming our good sense. We quickly realized that the herd was getting away and made a sprint for the other side of the meadow. Once we were across the meadow and inside the timber; we could hear several different bugles, coming from the direction the herd disappeared to. This was one spot that the trees weren’t spaced so far apart and visibility was limited. 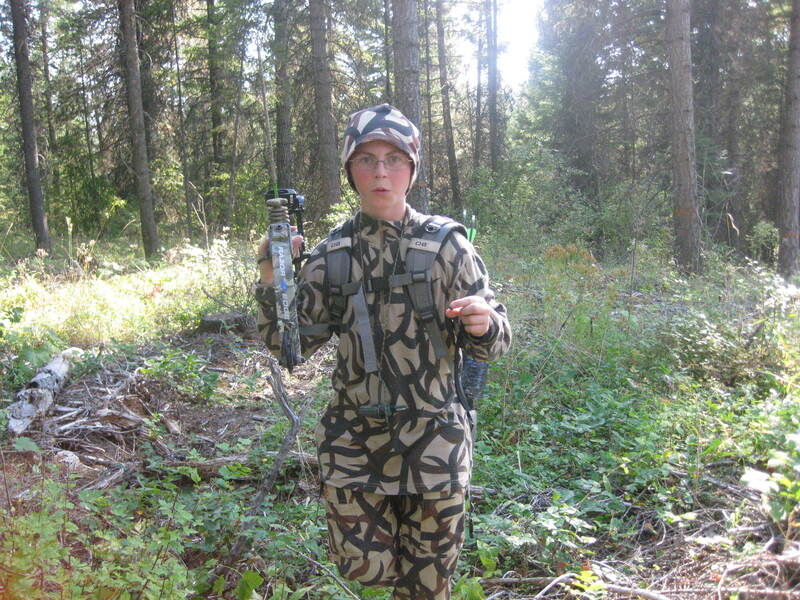 Once we got across the meadow and into the timber; things got a little interesting. It seemed that there were several satelite bulls that would respond to our calls; but we could never get a good look at them...frustrating! It didn’t take us too long to figure out that the herd must have kept up their pace and kept on the move. Yet; we couldn’t be so quick to jump to conclusions and proceeded as stealthily as possible. We had split up and moved off through the timber; keeping tabs on each other with soft mews. Knowing that it did myself no good to get out too far from Darin; I tried my best to use the wind and stay behind him as we snuck through the pines. Several times a bull would bugle at us and seem to be coming in on a string; only to go silent. We’d meet up scratching our heads, wondering out loud where he went; when out of nowhere, a sudden bugle would break the silence…the bull had snuck in silently almost into our lap! But of course big bulls don’t get big by being completely dumb and would prove to out smart us time and time again. This corner of the property seemed to be thick with satellite bulls; but they were hesitant to leave the herd for long. 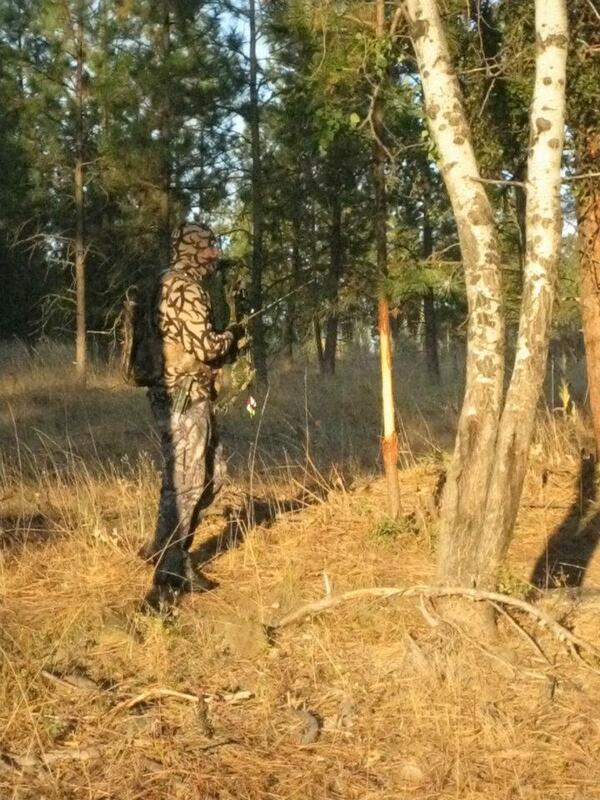 Darin checking a fresh rub on our first morning's hunt. A quick start to a so far epic season. 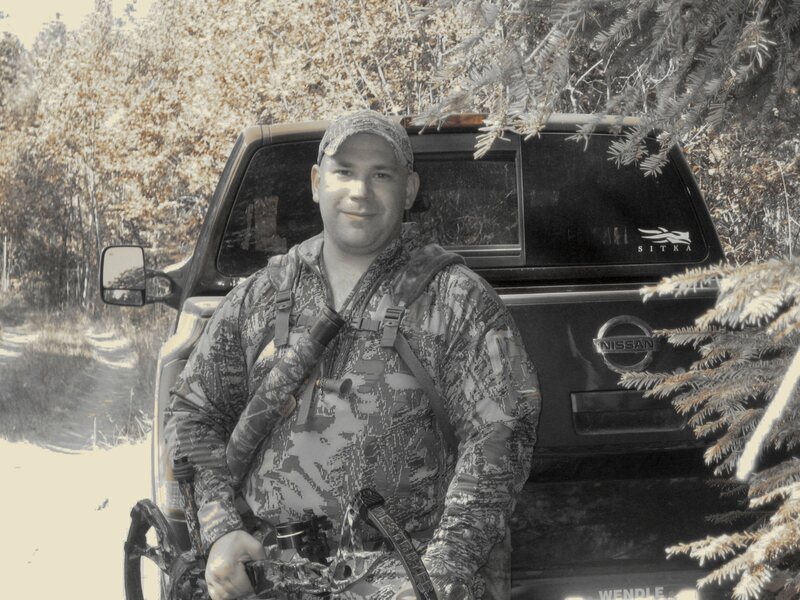 I can't belive the start we've had to our 2011 hunting season. It almost seems surreal...if this isn't an epic season, then I guess I'm just destined to eat tag soup! This hunting season started off very quickly with one elk downed by a friend on opening day. 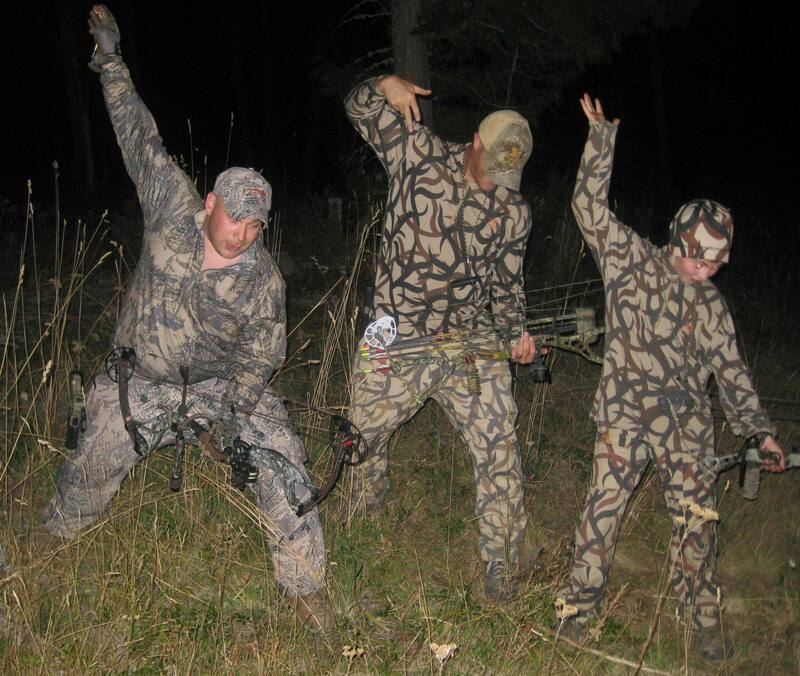 It was only days later that Ethan, the 11-year-old step-son of the same friend, took his very first deer with his bow. 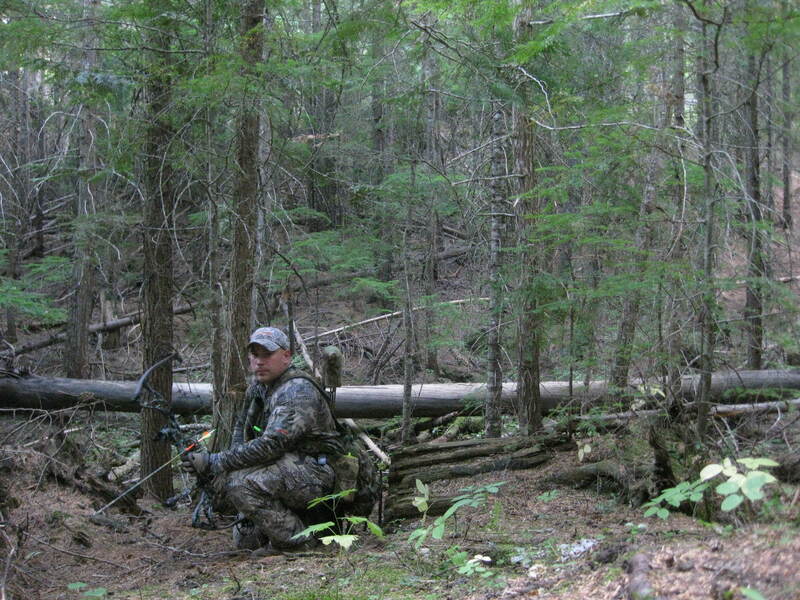 Even though success had seemingly come quickly to my camp; the hunting has been very tough. 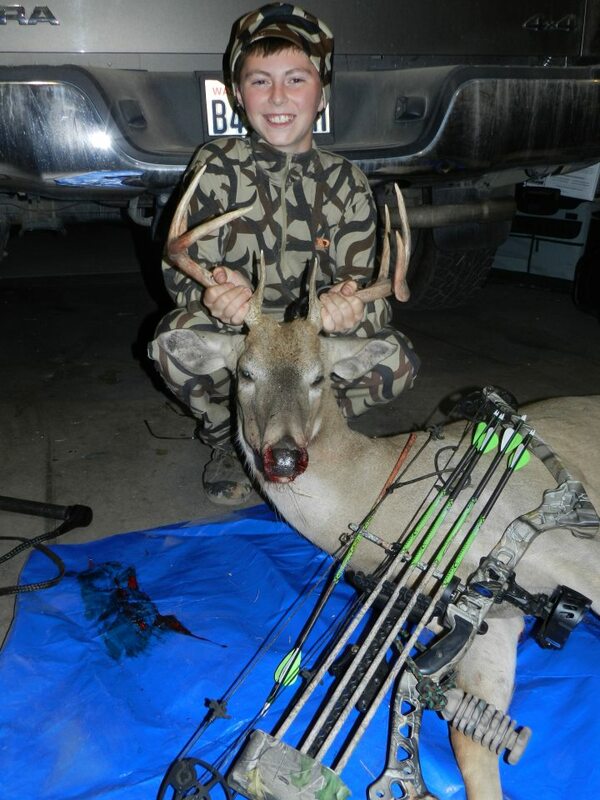 Ethan really did it up big when he notched his first big game tag. Not only did he manage to take a very fine buck; but he did it with his bow and on the ground! I couldn't be more proud of him if he was my own son. With the way things started, I figured to fill at least one of my tags just as quickly…but so far no such luck. The temperature has been in the upper 90’s and broke 100 degrees on at least one day. According to the moon phase calendars, there were a few “four star days” in a row this past week; which would indicate that despite the heat, game would be moving. Well, at least on the day that Ethan took his buck, the moon phase predictions proved true; the deer were moving in the midst of 90 degree heat and didn’t seem to care one bit. To say things have been exciting this past week and a half; would be an understatement. I was able to call in my best friends first elk, passed up a shot opportunity on a nice black bear from only 20 yards (I hope I don’t regret this later! ), had a coyote try to ambush me (apparently he thought I was an elk and laid in wait until I was only 10 yards from him and decided that “he didn’t like me” and quickly bounded off) and I called in what we thought at first was a rutting bull elk….but turned out a full hour and a half later to be a good-sized bull moose! 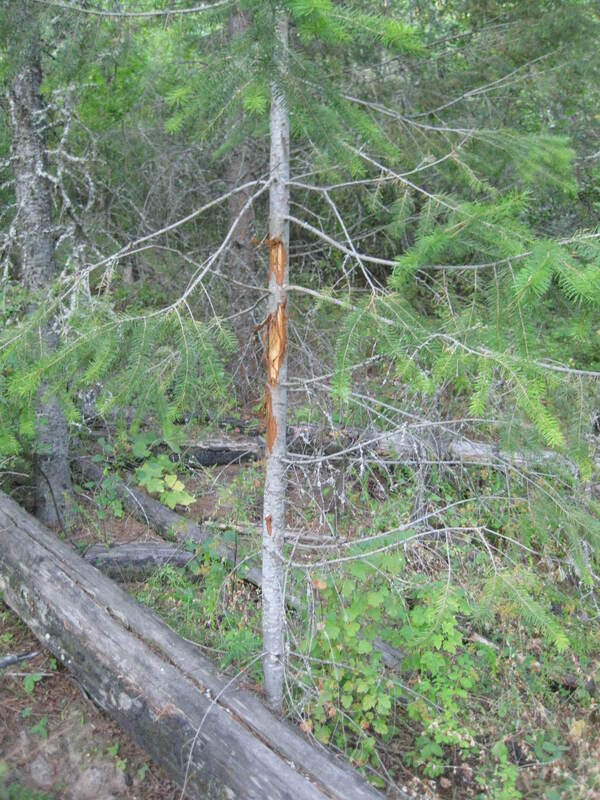 Apparently the moose was rutting too, because every time I’d hit a certain note on my call; he’d go nuts, let out a snort and destroy a tree. If only I would have had a moose tag, I definitely would have filled it right then and there; he ended up trotting past me at only 20 yards! Darin going to work on this season's first success. I’ve been spending as much time in elk camp as possible. I’m feeling a little frazzled; going from work to the elk woods, waking up to the sounds of elk bugling to start off the morning with a quick hunt and then back to work and so on. 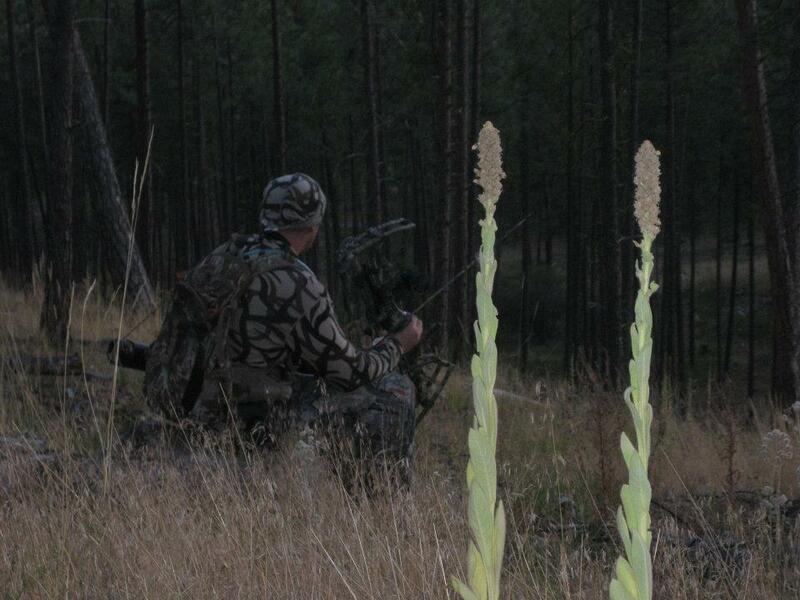 With the heat and so far the unpredictable movement of the elk in our area; the hunting has been very tough. I have two more days this week to make a go of it before my september elk season will end and then I head to Montana to help Darin fill his Montana elk tag. It’s do or die time; get an elk or bust! A bear I passed a 20 yard shot on. 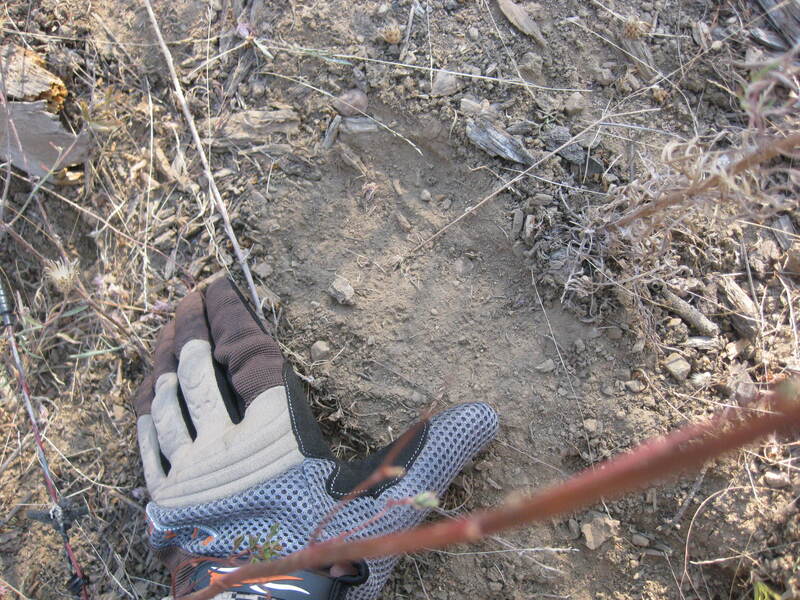 Big bear track...I won't pass this guy up if I get another chance! "I think I just heard something...!" Darin laying down some scent near a good wallow we found in a cedar grove. 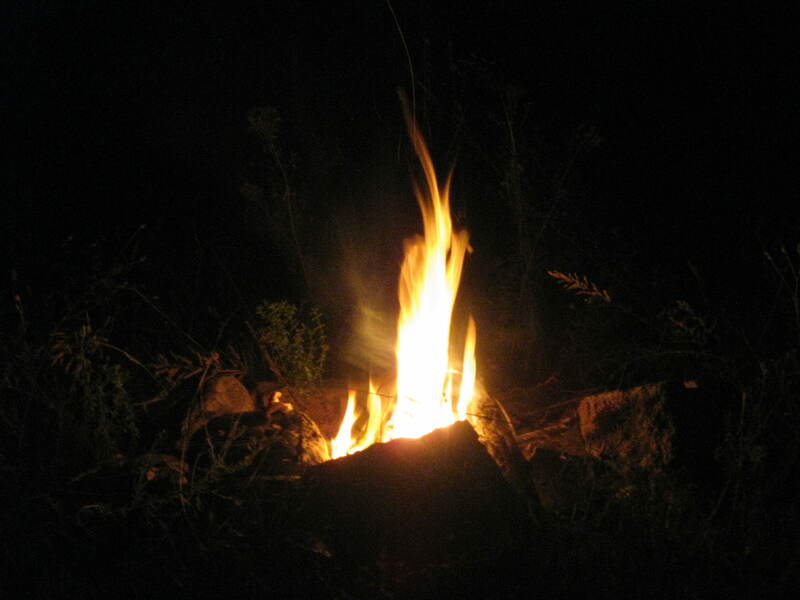 The camp fire is always an important part of the elk camp experience. Bowtech nerds! I think we've spent way too much time chasing elk! Darin said that "Uncle Ted was starting to make sense" to him...yep, The Spirit Of The Wild is starting to come over us! 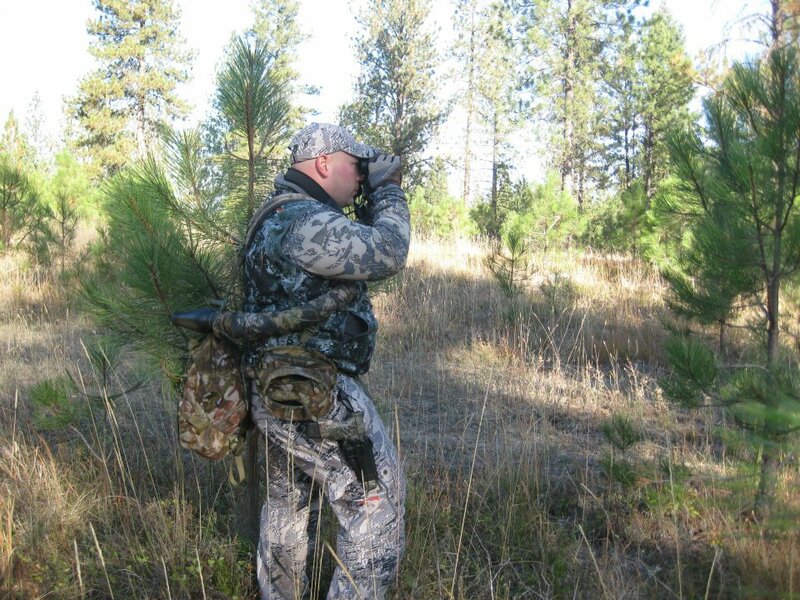 Getting into position; we hear elk coming in. I can never say enough about the stuff that Sitka Gear puts out and this year is no different. I’ve been using the heck out of my Mountain Pants, Shooter Gloves and Merino Core Zip T. Darin, Ethan and I have all been wearing Merino wool pieces and have been amazed at how remarkably your temperature remains regulated even in 90+ degree heat. I definitely recommend you check out Sitka’s Merino pieces.